Home › International politics › Is the use of chemical weapons in Syria of more importance than the eradication of Christianity? Is the use of chemical weapons in Syria of more importance than the eradication of Christianity? 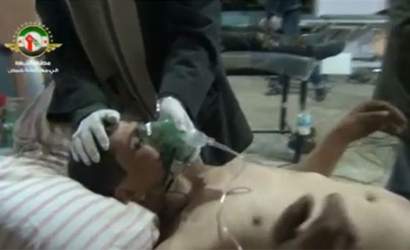 Save There is no doubt that it is an atrocity to use chemical weapons against anyone, even more so your own citizens. It is right that governments and the UN, in the interests of peace and further loss of life, should be considering a response to the chemical attacks in Syria. However, anyone who has even a basic understanding of the situation in Syria will be able to see that it is a vastly complex and difficult situation and that there are no easy answers. Past intervention in Iraq and Afghanistan have taught us that military intervention leads to unforeseen and unpredictable outcomes, many of which can be disastrous for civilian populations. Whilst the situation in Syria is horrendous, and the urge to intervene is a natural response, unless the UN or Western governments somehow manage to piece together a credible plan of action that will significantly improve the situation, any intervention could be considered foolish at best. It’s therefore welcome to see that some lessons appear to have been learnt from the Iraq war as we see so many MPs voicing serious concerns going into today’s debate and vote in Parliament. There used to be 80,000 Christians in Homs. The last one was murdered almost a year ago. Only five months ago in Benghazi, Libya, 60 Christians were rounded up by extremist vigilantes. Some were tortured; one was murdered. The media didn’t stream the horrors live into our living rooms: HM Government ‘stood by’ and ‘did nothing’. On 9 July Open Doors—as you know, a charity set up to support Christians facing persecution and based in your constituency—presented a report to Foreign Office Minister Alistair Burt at a Parliamentary meeting that highlighted the particular vulnerability and targeting of the Christian minority communities within the wider Syria crisis. We have been clear that while an end to the crisis is vital for the sake of all the people of Syria, Open Doors has committed itself to speak up on behalf of the Christians in Syria in particular. That is why I am writing now in the light of the recall of Parliament following last week’s awful outrage. There are many issues to consider as you weigh up the options in responding to this crisis. I have written to ensure that the voice of Christians in Syria is not forgotten, especially as around 100,000 people have now signed our Save Syria petition urging, on behalf of the Christians of Syria, that all those with influence and power do everything possible to protect the lives, livelihoods and freedoms of all the people of Syria. My colleagues recently met a group of church leaders from Syria who were clear and emphatic that the priority for the international community was to support an inclusive Syrian-led political process to find a political solution, and to do their utmost to get all relevant actors at the table to discuss the future of Syria and all Syrians. We want to ask the question: will this process be helped or hindered by any military intervention by the UK and the USA? We know that Parliament will debate this issue seriously and carefully. We want to assure you of our prayers for you and your colleagues at this vital moment. The point is not that Christians are in any way more important than Muslims, Jews or any other religious or ethnic group. All human life is of equal value. What is of importance is that as our government and Parliament meet to thrash out this issue there is an acknowledgement and awareness that there is far more to be considered than just the use of chemical weapons. For some living in Syria any Western intervention is likely to have devastating and long lasting consequences. Please get this to Therese Coffey. Theresa is not my MP but you could send it if you want! Gillan, you talk of interventions – by the West – leading to “unforeseen and unpredictable outcomes”, in which you include persecution of Christians as a major component. I suggest that this outcome is/was neither unforeseen nor unpredictable … it is a pattern that goes back at least to the demise of the Ottoman Empire, and has included responses to non-military interventions by Western governments & NGOs in Sudan much more recently. What seems to me more germane is that this has been either un-remembered or ignored. When I was talking about unforeseen outcomes I wasn’t including persecution of Christians under that, but perhaps I didn’t make that clear enough. Thanks for your well made points. Christians in Syria are split, although it is probably true that more Christians support or at least consent to rule by the Assad regime than are outspoken opponents of it. I don’t want to understimate the real fear that many Syrian Christians must feel at the prospect of a rebel victory, but we shouldn’t forget that Syria’s Christian leadership has been in bed with the Assad regime for a long time (as has the Sunni Muslim leadership, which is also pro-regime). I don’t want to ignore or downplay the significance of extremist rebels targetting Christians, but this war is not fundamentally about religious persecution: it is about a fascistic dictatorship killing anyone who opposes it (and the primary reason for Christians being attacked by extremists is that they are perceived to be supporters of the regime, not that they are Christian). I don’t actually have any objection to people taking a particular interest in the fate of co-religionists, and despite the provocative start to my post, I’m not actually suggesting that you are happy to see hundreds of thousands of Syrians killed. However, whether or not you think that any given action is appropriate (be that air strikes, supporting the moderate rebels with weapons, or anything else), it strikes me that the emphasis of your blog post is wrong. Surely we should be considering the fate of all Syrians, not singling out one sect or group of them. This is what imperial powers have always done, after all: divide and rule – make minorities fear the majority and so prop up the regime. One could argue (as the extremists do) that this war is a about a Shia/Alawi regime persecuting Sunnis. But it’s not. The two sides are largely, although not wholely, split along religious and sectarian lines, but they are fighting for power and their lives, not religious doctrine. thank you for some very valid points. I agree that one minority group shouldn’t be seen to be more important than any others, or less important for that matter. There appears to be a certain level of hypocrisy from governments where they react to chemical weapons (which they should) but not to other attrocities. Christians have suffered a huge amount over the last two years in Sryia with very little notice being taken. I’m just trying to bring a bit of a wider perspective to the debate. I was working in Nazareth, Israel during the first Gulf war and found out how we “christian” countries were despised by ALL sides – including the minority Christians. Through my mind runs the Quote by Bill Clinton after the Columbine High Shooting in April 1999 “We need to teach our children… to resolve conflicts with words, not weapons” as he rained death and destruction on Serb civilians. Our leaders didn’t learn then and STILL haven’t learned that lesson, to our eternal shame.. It just seems to me that the sudden concern from the UK and US suggests that bombs and bullets are OK, but gas isn’t. It all has the same ending – death and injury.